Auto manufacturers today realize the car ownership experience must be a far-extending phenomenon to promote loyalty. Auto companies like Ferrari fosters favour for vehicles like the latest 458 Italia thanks to a wide merchandising chain. Mopar merchandise and Mercedes-Benz apparel have also been hot sellers as companions for diehard brand followers blossoming into a meaningful side business. Thanks to the mobile app marketplace, the connection to drivers has become virtual. While some of the popular smartphone and tablet apps attract the enthusiast experience of a vehicle, others provide important methods to link customers to needed service. The OnStar RemoteLink and Audi Roadside App are a few emerging examples for how a smartphone application can provide distressed drivers with relief. Just in time for the numerous holiday treks, Acura owners will have an enhanced roadside assistance service utilizing mobile devices. 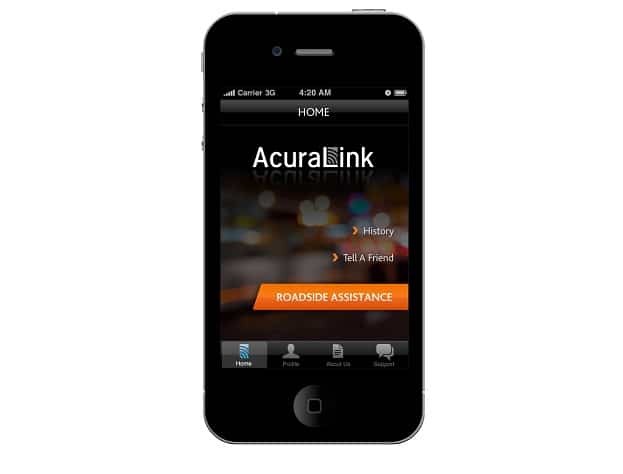 The AcuraLink Owner’s Mobile App is devised as a companion to the existing Acura Roadside Assistance Programs. Currently available only on Apple iPhone devices, owners of 2012 Acura vehicles such as the revised TL sedan or TSX Sport Wagon gain a free tool for a range of automotive services. Created in partnership with their roadside service provider Cross Country Automotive Services, the AcuraLink Owner’s Mobile App regularly serves the user with a valuable emergency link. Whether a vehicle needs a tow, battery jump-start or if an owner is locked out of their vehicle, the Acura Roadside Assistance services can be easily dispatched through the AcuraLink Owner’s Mobile App software. The Apple iPhone’s GPS technology guides the roadside service personnel to the user’s location easing potentially lost motorists. Providing the contact information of the towing company as well as an estimated time of arrival, Acura owners are given an increased sense security in moments assurance is important. The roadside assistance services provided at no charge to Acura owners under warranty as a 24-hour, 7 days a week protection. Acura drivers outside of this vehicle coverage plan for an additional fee. AcuraLink Owner’s Mobile App can be downloaded on the Apple App Store or from the Acura.com website page. The AcuraLink Owner’s Mobile App is presently not available on Android, Blackberry or other wireless devices. Acura has been very susceptible to the tough 2011 calendar year for Honda Automobiles. Due to the great dependence on the Honda’s Japanese resources for cars as well as parts, Acura suffered lighter inventories because of the March earthquake and tsunami disaster. Aside from production impairments, Honda’s premium car brand is suffering from less than ambitious activity as most of the 2012 Acura line-up remains largely unchanged. At the end of October 2011, Acura division sales in the United States are down to 6.6 percent. Acura has been able to claim a technological edge over luxury car rivals and are relying on their enhancement through the App could be a building block. 1 Comment on "Acura Roadside Assistance Steers into App World"
Definitely a very useful app that customers will appreciate since they won’t have to worry about being stranded on the road if they have their smart phone with them.